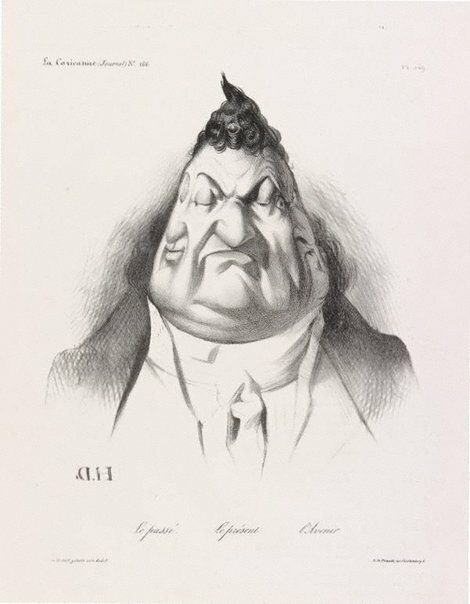 The enduring image of King Louis-Philippe as a pear was invented by Charles Philipon but it was Daumier who employed it most brilliantly in many of his prints. The image alluded to the Citizen King’s jowly face and corpulent figure, and to the double meaning of the French word ‘poire’, signifying both ‘pear’ and ‘imbecile’. Here the expressions on a three-faced pear change from a smile to a malevolent scowl. Signed l.l., [inscribed on stone] "H.D.[reversed]". Not dated. Citizen Artist - Daumier and his time , Sydney, 1991, p 6. Prints & drawings Europe 1500-1900 , Sydney, 2014, col illus p 131.